Comments: James Benson Tindall, Sr., began his career as a businessman at Brown's Landing (now Hatton) in 1906 when he rented Brown's Store and renamed it 'J. B. Tindall's Groceries.' In 1914, Tindall purchased the store from Brown's descendants and managed it until his death in 1945. This store was built on a strong foundation comprised of large stones that Brown took from the James River and Kanawha Canal lock about one-half mile away. When Tindall took the store over, there was a large stone outside its front door, which quite likely came from the old canal lock. The stone stood in full sun during the day and afforded Tindall an outstanding location to grow tomatoes from seed. He filled a box with manure, planted tomatoes in it, and sat it on the sun-washed rock to thrive every year until just before he died in 1945. Tindall enjoyed great success with his tomato plants and gave away his extra plants free to customers who admired them. 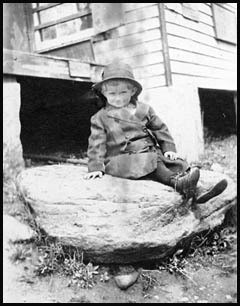 Shown at right is Tindall's son, Jim, Jr., in 1919 as he posed for a photo on his father's tomato stone. 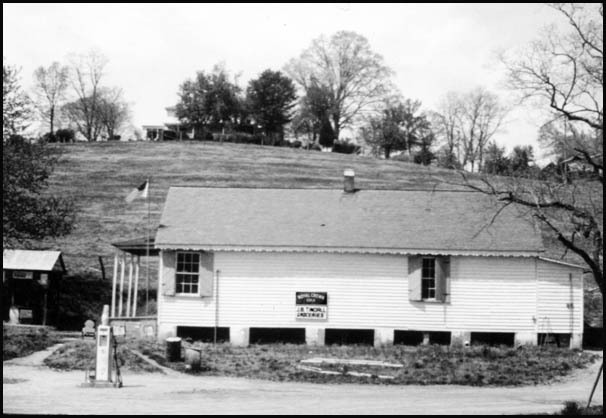 This country store sold dry goods, groceries, pills, baking soda and sugar in barrels, clothes, hardware, shoes, kerosene oil, and fresh produce with customers across the river in Buckingham and the surrounding Albemarle countryside. When the store's grocery shelves needed restocking, Tindall rode the train to Richmond and shopped at several wholesale houses there. He would get to Richmond about 8AM and catch the 5 PM train back to Hatton, a three hour ride away. Drummers also came to Hatton to take orders for dry goods and shoes; Tindall would measure men for suits and hand the drummer a suit order to be placed. Twice a year, the shoe salesman arrived via train from St. Louis, Missouri, to take shoe orders. The store also contained the Hatton Post Office for which Tindall was the appointed postmaster. Some customers came four times a week to pick up their mail; others, once a week on a trip that coincided with their need to buy groceries or other supplies. Tindall employed several young men to help with such store duties as taking orders or stocking shelves. Johnny Jones, a young black man, came to work for Tindall at age 15 and was of invaluable assistance. Johnny could not read, but he excelled at stocking grocery shelves by matching the labels. He also was extremely honest; if he found a piece of change on the floor, Johnny would put it on the cash register with the statement, "'Tain't mine!" One day a customer found a coin on Tindall's floor and started to put it in his pocket. Johnny saw him do it and said matter-of-factly, "Tain't yours!" Tindall's son, Jim, Jr., started helping his father at the store at an early age. As his school schedule permitted, Jim would accompany his father to Richmond to buy groceries for the store. Once as a young boy, Jim caught the measles in Richmond and, upon his return to Hatton, infected 12-14 school children at his nearby country school plus one set of parents. After Jim graduated from Scottsville High School, he returned to Hatton to work fulltime at the store, train station, and in his father's ferry and timber businesses. There was much activity in and around the store, ferry, and train station. Two railroad tracks ran through Hatton: the mainline and a sidetrack. Often forty wagons a day, loaded with railroad ties, would cross the river via the Hatton ferry from timber-rich Buckingham. 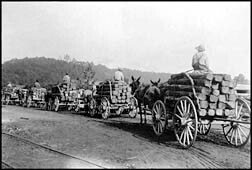 Railroad ties or pulpwood was stacked between the landing road and the railroad track and left there to dry to reduce rail transportation costs. When the wood was dried, the railroad inspected the ties and paid Tindall about $1 per tie. The ties were then loaded on freight cars for shipment. Much of the pulpwood at Hatton went to Buena Vista or Covington. Tindall hauled surplus ties to Lexington where coal mine operators purchased them for shoring up mine tunnels. When James Tindall, Sr., died unexpectedly in 1945, his son, Jim, Jr., took over management of J.B. Tindall's Groceries and became the Hatton postmaster. He ran both facilities until his retirement in February 1973. The top two photos are part of the James Benson Tindall, Jr. collection. James resides in Scottsville, Virginia, and is the son of James Benson Tindall, Jr., and Mary Alice (Tapscott) Tindall. The bottom photo is part of the Kathleen McNamara collection; Kathleen resides in Scottsville, Virginia.